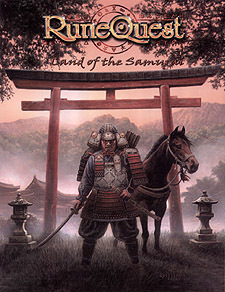 Set in the Heian Period of Japanese history, when the Shinto faith was starting to give way to Buddhism, when the Samurai were making their climb to power, in a land of legends; Land of the Samurai is a stand alone RuneQuest game, designed for those of you who enjoy a huge pile of reality mixed in with your fantasy. Included are new professions and backgrounds along with advice on creating exciting characters, with which to explore this fascinating period. Also an in-depth look at the Shinto and Buddhist faiths, along with the variety of other factors that influenced life in Japan at this time. Predominantly, this book covers the rise of the Samurai and other martial classes and even gives the option of introducing Ninjas... not technically of this period but a whole lot of fun to utilise none the less. Encounter the monsters and Myths that have been the stuff of Legend for over a millennium. Experience the Imperial life or that of a Samurai. Understand the importance of defending the honour of you and yours - no matter what it costs you. A scenario, along with extra advice for Games Masters, ensure that Land of the Samurai will provide Players with an exciting, enlightening and even sometimes spiritual experience time and again.